In Part I, I had to patch qtmultimedia for the camera to work, but Qt compilation is resource hungry, same goes for the osrm compilation, the memory of the Raspberry Pi is too small. I had to to set up a cross compilation system in my case for armv7h. Since most of the application is in QML, I’ve used the c++ main.cpp launcher as long as possible for the development. At the moment I needed to inject data from the outside world (like the GPS location) to QML via Qt, so I switched to Go using therecipe Qt Go bindings. The Go bindings project is young but the main author is really active fixing issues. It makes desktop applications easy to code without the assle of C++ (at least for me). That’s just the narrative, truth is Creator is really buggy and I edited the ui files by hand most of the time. In Part I, we talked about OpenMapTiles and OpenGL rendering, but I needed a web server capable of reading MBTiles format and serving the necessary assets for the map to be rendered. I’ve created mbmatch in Go for that purpose so mocs can render the map without Internet access, it will also map match the positions in the future. This touchscreen is handled as a one button mouse. It can be calibrate using tslib ts_calibrate command. Then in your start env tell Qt to use tslib. Like I said in part I, the Linux gps daemons are using obscure and over complicated protocols so I’ve decided to write my own gps daemon in Go using a gRPC stream interface. You can find it here. I’ve started POIs lookups with full text search and geo proximity using bleve by exposing an API compatible with the OSM API so it can be used directly by QML Locations. I’ve open sourced most of the code for Mocs on github, feel free to contribute. Here is my journey to transform my car into a modern system running on RPi3 (a never ending project). I’m using an Rpi3 (old model). With Arch for ARM but any system will do. An USB 2.0 EasyCap to retrieve the composite signal. No driver needed for both the screen and the video capture dongle. mplayer is working out of the box, so I thought everything was okay with the camera, so I thought. I needed a GUI to display the camera and the date (at this this time this project was just a rear camera display). One solution is to force a pipeline with an interlacer. I had a serial GPS around, why not display a moving map? I thought it would be very easy to read NMEA via serial. It was, gpsd worked in seconds but … it seems we can’t disable the auto speed, equal 4s lost at start. Plus Qt is using libgeoclue or Gypsy which does not want to talk with gpsd. So one thing led to another… I’ve written a very small and simple gpsd in Go with a gRPC interface, so it can be queried from anything. It’s also a bit more advanced since it can map match & route match the positions with OSRM. 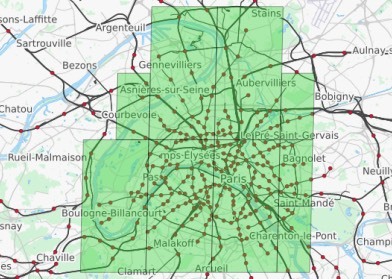 OpenMapTiles project is great to generate vectors data in MBTILES format, you can serve them with mbmatch. Qt Map QML can display them using the mapboxgl driver, some free styles are provided. 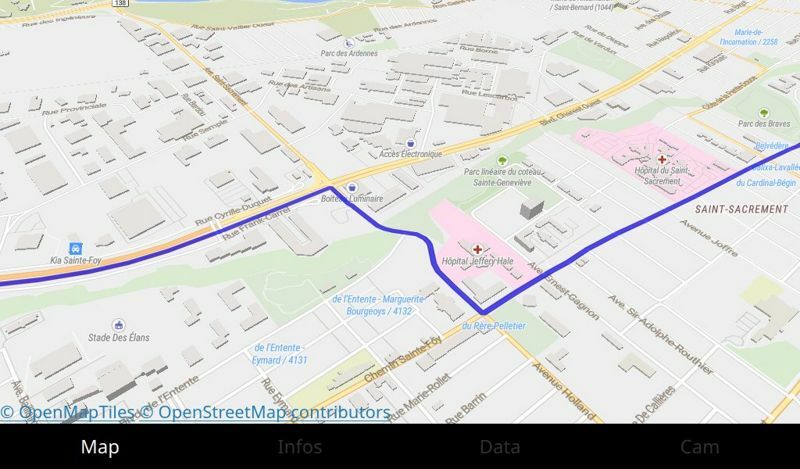 Here is an example QML Map plugin. Using the mapboxgl renderer under X11 on the Rpi3 is taking a lot of ressources. Qt5 is capable of directly talking to the GPU without X11, the performance difference is night and day. So just run your Qt app without X11 with the following env vars. Hopefully the provided Qt osm plugins knows how to route using the OSRM API. So you can run a local OSRM backend for routing and it will just work. 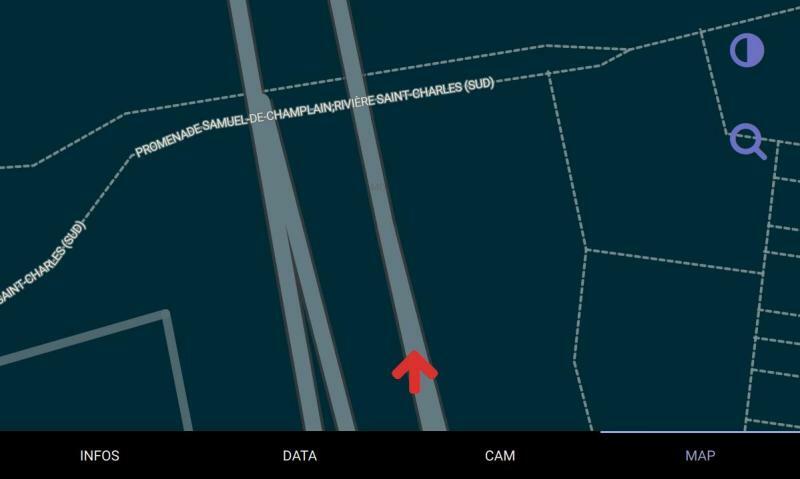 The app can display the rear camera and a moving map !! 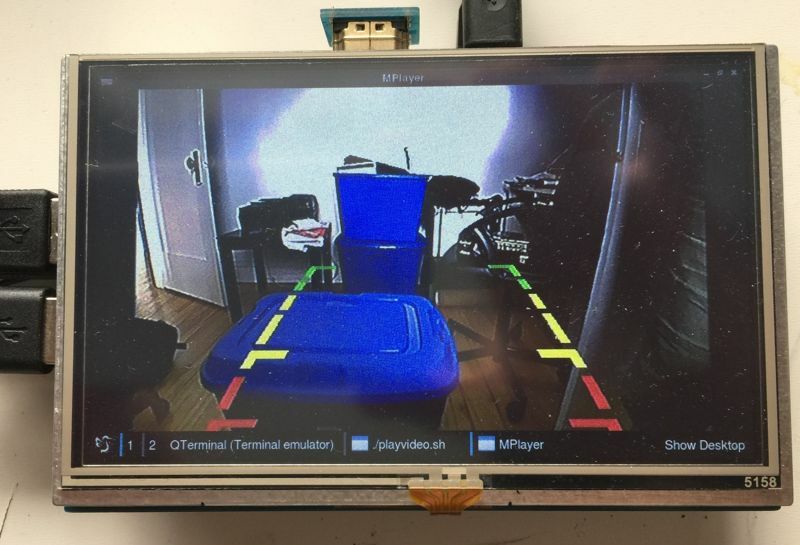 Part 2 will be about searching places by extracting OSM data and indexing them in a small Go program that can run on the rpi, reading ODB data from the car via Bluetooth, packaging the whole thing and open sourcing some code. Google is working again on S2 a spatial library !!! And they even have created a website to communicate about it s2geometry. The C++ port contains a Python Swig interface. I’ve been using an unofficial Python port with Jupyter for years now things are way more simpler. If you read this blog, you know I’ve recently released a project called regionagogo, a geo shape lookup database, described in this blogpost. It uses the current Go S2 implementation, which is not yet as complete as the C++ implementation, for example the region coverer of a shape does not really compute cell around the shape but around the bounding box instead. Using the shape of the polygon makes the covered cells more precise and smaller, resulting at the end to less PIP tests which are costly. The same coverage with Go S2 would have returned 8 big cells of the same size, covering over regions. I’ve created regionagogogen a quick and dirty command line program for OSX that takes a GeoJSON file containing your regions and then compute the database using the S2 C++ implementation, it’s for OSX only cause I’m using ObjC as a bridge to C++ which I don’t know enough. Also note that regionagogogen includes an S2 port that works on iOS/OSX and some ObjC geo helper classes. The Docker image fore regionagogo is also using the optimized database. 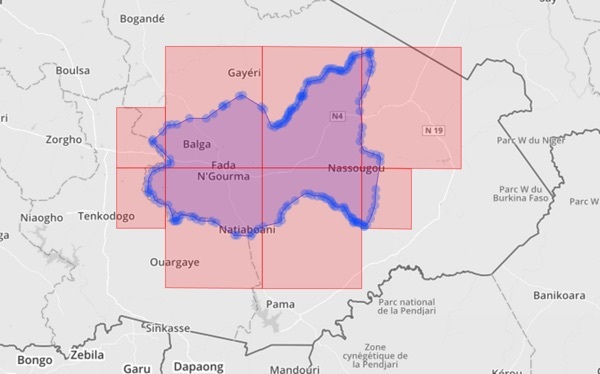 On a previous post, I’ve described how to use the S2 geo library to create a fast geo database, but it was to store locations (points) and only to perform range queries, a complete geo database would have regions/polygons queries. I had this need: querying for the countries or subregions of hundreds of coordinates per second, without relying on an external service. One solution, using my previous technique, could have been to store every cities in the world and then perform a proximity query around my point to get the closest cities, but it works only in populated area and it’s only an approximation. I looked into others solutions, there is some smart ideas using UTF-grid, but it’s a client side solution and also an approximation tied to the resolution of the computed grid. S2 cells have some nice properties, they are segments on the Hilbert curve, expressed as range of uint64, so I had the intuition the problem to perform fast region lookup could be simplified as find all mathematical segments containing my location expressed as an uint64. Using a Segment Tree datastructure, I first tried an in memory engine, using Natural Earth Data, loading the whole world countries shapes into S2 loops (a Loop represents a simple spherical polygon), transforming then into cells using the region coverer, it returns cells of different levels, add them to the segment tree. To query, simply tranform the location into an S2 Cell (level 30) and perform a stubbing query that intersects the segments, every segments crossed are cells that covered a part of a Loop. It will reduce the problem to test a few Loop vs thousands of them, finally perform ContainsPoint against the found loops cause the point could be inside the Cell but not inside the Loop itself. The segment tree structure itself is very low on memory, the loops/polygons data could be stored on disk and loaded on requests, I’ve tested a second implementation using LevelDB using this technique. If you have a very large tree (for example cities limits for the whole world), you can even put the segment tree on a KV storage, using this paper Interval Indexing and Querying on Key-Value Cloud Stores. As a demonstration here is a working microservice called regionagogo, simply returning the country & state for a given location. It loads geo data for the whole world and answers to HTTP queries using small amout of memory. Here is a Docker image so you can deploy it on your stack. Note that it performs really well but can be improved a lot, for example the actual Go S2 implementation is still using Rect boxing around loops, that’s why regionagogo is using a data file so it can be generated from the C++ version. It can be a solid foundation to create a flexible and simple geo database. Six months ago, I wrote on this blog about Geohashes and LevelDB with Go, to create a fast geo database. This post is very similar as it works the same way but replacing GeoHashes with Google S2 library for better performances. There is an S2 Golang implementation maintened by Google not as complete as the C++ one but close. I personnaly use BoltDB and gtreap for my experimentations. This post will focus on Go usage but can be applied to any languages. Or skip to the images below for visual explanations. 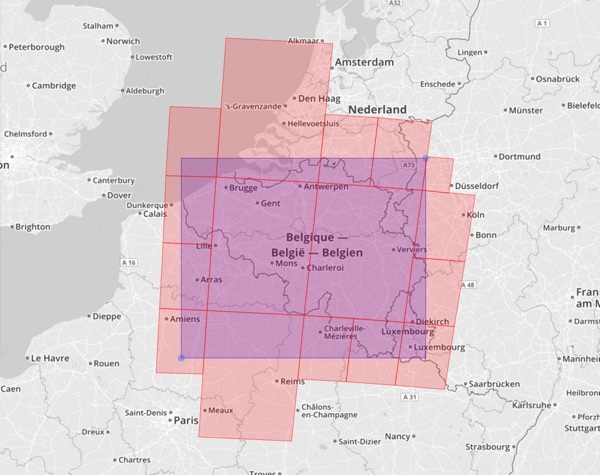 Geohash is a great solution to perform geo coordinates queries but the way it works can sometimes be an issue with your data. Remember geohashes are cells of 12 different widths from 5000km to 3.7cm, when you perform a lookup around a position, if your position is close to a cell’s edge you could miss some points from the adjacent cell, that’s why you have to query for the 8 neightbour cells, it means 9 range queries into your DB to find all the closest points from your location. If your lookup does not fit in level 4 39km by 19.5km, the next level is 156km by 156km! The query is not performed around your coordinates, you search for the cell you are in then you query for the adjacent cells at the same level/radius, based on your needs, it means it works very approximately and you can only perform ‘circles’ lookup around the cell you are in. The most precise geohash needs 12 bytes storage. -90 +90 and +180 -180, -0 +0 are not sides by sides prefixes. S2 cells have a level ranging from 30 ~0.7cm² to 0 ~85,000,000km². S2 cells are encoded on an uint64, easy to store. The main advantage is the region coverer algorithm, give it a region and the maximum number of cells you want, S2 will return some cells at different levels that cover the region you asked for, remember one cell corresponds to a range lookup you’ll have to perform in your database. Using level 5 we can’t fit the left part of the city. We could add 3 cells (12 total DB queries ) on the left but most algorithms will zoom out to level 4. But now we are querying for the whole region. Using s2 asking for 9 cells using a rectangle around the city limits. The zones queried by Geohash in pink and S2 in green. Let’s say we want to store every cities in the world and perform a lookup to find the closest cities around, first we need to compute the CellId for each cities. Big endian is needed to order bytes lexicographically, so we can seek later from one cell to the next closest cell on the Hilbert curve. c is a CellID to the level 30. Now we can store key as the key and a value (a string or msgpack/protobuf) for our city, in the database. For the lookup we use the opposite procedure, first looking for one CellID. Then compute the CellIDs for the region we want to cover. RegionCoverer will return at most 8 cells (in this case 7 cells: 4 8, 1 7, 1 9, 1 10) that is guaranteed to cover the given region, it means we may have to exclude cities that were NOT in our rect, with func (Rect) ContainsLatLng(LatLng). Congrats we have a working geo db. You probably have heard of LevelDB it’s a blazing fast key value store (as a library not a daemon), that uses Snappy compression. I needed a low memory low cpu system that could collect millions of geo data and query over them, Geohash has an interesting property you can encode longitude and latitude into a string : f2m616nn this hash represents the lat & long 46.770, -71.304 f2m616nn, if you shorten the string to f2m61 it still refers to the same lat & long but with less precisions f2m61. A 4 digits hash leads to 19545 meters precision, to perfom a lookup around a position you simply query for the 8 adjacent blocks. A Geohash library for Go. We can have a more generic solution, first we need a key a simple int64 uniq id. Here we can encode a key with a Unix timestamp so our key is not just a key it’s also an encoded time value, it will be uniq thanks to the nanosecond precision. We are using BigEndian so it can be byte compared: older will be before newer after. G201508282105dhv766K��Ϸ�Y� (note the end of the key is binary encoded) You always need a prefix for your keys so you can seek and browse them without running over different keys types, here I have a G as Geo, then a string encoded date prefix, so we can search by date, but we don’t want extra precision here, it would add extra seek to LevelDB, (that’s why we have a modulo of 10 for minutes) then we add a precise geohash and finally our previous uniq id. We can now lookup by flexible date & by flexible proximity like a Redis ZRANGE, you simply need to reverse the process. It can be optimized, reducing the size of the keys, but it performs extremely well storing around 3 millions geopoints per day, using less than 3% cpu and can received hundreds of queries per second. I could maybe turn it into a library but it’s so simple it’s probably useless. Next blog post: what are those millions points used for?